For our PYP Unit "Every Life Has a Story," my students are reading biographies. I have a variety of texts available for book circles, will have kids watch biographies on www.brainpop.com, and everyone will read at least one "Who Was..." book, which is like mainlining a biography. One of my groups is going to read a variety of picture books. 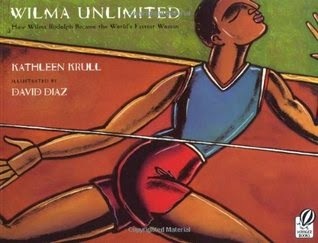 Wilma Unlimited: How Wilma Rudolph Became the World's Fastest Woman is my favorite that I have read so far. It is really beautiful, with dynamic illustrations layered over photographs that relate to the page's topic. I only vaguely knew about Wilma Rudolph, so learned a lot about her and the perseverance that she showed throughout her life. Imagine going from a child who was unable to walk to an Olympian. Now I want to read a book about Wilma's mother, who had 22 children! 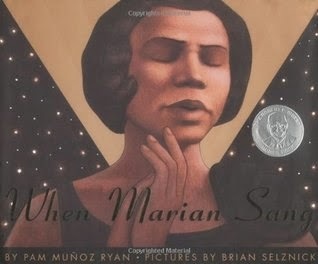 When Marian Sang tells the life of Marian Anderson, a gifted singer who performed before an integrated crowd of 75,000 people at the Lincoln Memorial. I had never heard of Anderson before and know that my students won't have either. While the writing was fairly ordinary to me, the illustrations are gorgeous. The muted colors and attention to details had me savoring the pages. I don't know many small children who would enjoy this as a picture book, but in a study of biographies, it makes a great addition to a middle grade collection. Wanted Dead or Alive: The True Story of Harriet Tubman was published in 1965, and it shows. It could be placed next to When Marian Sang as an example of how far children's books have come. The illustrations are sketchy, all blue, and at times reminded me of grave rubbings we used to do in Girl Scouts. 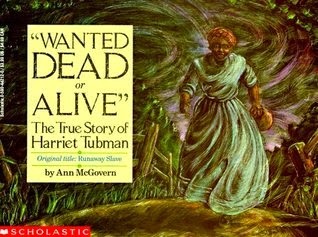 There was new information about Tubman in the book; in my head, she started the Underground Railroad, but now I know that isn't so. Still, there are so many better texts about this time period. 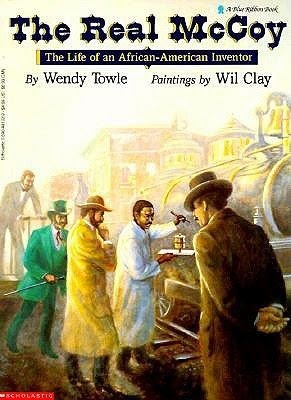 The Real McCoy: The Life of an African-American Inventor teaches the reader about Elijah McCoy, the inventor of the Oil Cup for locomotives, as well as many other inventions. I know I'll be thinking of him the next time I am at the ironing board! I love the idea of my students learning about the inventors or everyday items, and even better when they are people who showed determination and hard work to succeed. Something that I found interesting was that so many African Americans went to Europe so that they could be educated: Marian Anderson and Elijah McCoy both did so, then returned to the United States to struggle with racism. McCoy grew up in Canada, so I wondered why he moved to the US, when he could have had less problems in his birth country. I appreciated his advice for young people: "Stay in school. Be progressive. Work hard."